What is a Stroke or Cerebrovascular Accident (CVA)? A stroke in the brain is due to a change in blood flow to an area in the brain. There are two basic types of strokes. The most common is blockage to blood flow to an area of the brain and less common is a hemorrhage into an area of the brain. People may have a temporary stroke that resolves over a short period of time called a transient ischemic attack or TIA. Most strokes involve only one side of the brain at a time. 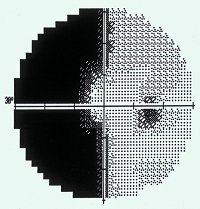 How is the Vision Affected from a Stroke? The occipital lobe in the back portion of the brain is responsible for our vision. The vision begins in the retina in the back of the eye. This is transmitted from the eye to through the brain to the occipital lobe in the back of the brain. Any disruption in this pathway will result in loss of vision. The right side of the brain provides the left half of our vision for both eyes and the left side provides vision for the right half of our vision in each eye. Nearly one in four people who have a stroke will have vision loss. What Type of Vision Loss Occurs from a Stroke? In most cases in which the vision is affected by a stroke, the vision loss is permanent. If the vision does improve, most of the vision improvement occurs in the first six months and will not improve after one year. Except for a short initial period of time, the person’s visual acuity is not affected with a stroke involving the brain. The vision loss from a stroke results in portions of the vision being lost or missing. This is like cutting and removing a piece of a pie. The same area of the vision corresponding to the portion of the brain that is affected is lost in both eyes. Someone who has a stroke in their right occipital lobe will commonly have a total loss of their vision to the left in both eyes. 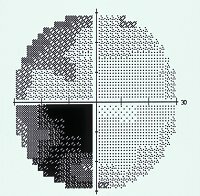 This is called a hemianopia (half of the vision) and another type of loss is a quadrantanopia (quarter of vision). Someone with vision loss from a stroke can still see 20/20 if their eye is normal but may only have half of their vision present in each eye. What Visual Symptoms Will Patients have After a Stroke? Treating vision loss after a stroke can be very difficult and takes a patient who is motivated and willing to work to improve their visual functionality. Patients can go to an eye doctor who specializes in treating vision loss from stokes and try prism therapy. Prisms bend light and they can be placed in glasses to shift images from one side of the visual field to the other. The patients can then be trained to use the prisms to improve their ability to function with their vision loss. Training can be done to improve a patient’s ability to scan their eyes more efficiently. Vision restoration therapy (VRT) has been developed to improve the brain’s ability to restore its vision capability.